There was a time when people like Avigdor Lieberman were not welcome in Israeli politics, or, indeed, in Jewish circles in the United States. Dogged by accusations of corruption (though acquitted in the Israeli courts) and widely considered a racist and flamethrower, Lieberman has emerged as Foreign Minister, a powerful cabinet post. There is no European cabinet minister who comes close to Lieberman’s far, far right positions, and if there were he or she would be boycotted by the other Europeans. Probably Hungary’s Jobbik (some 1/5 of parliament seats) comes closest to the themes of the ruling Israeli far right at the moment. So Lieberman led a charge to reject the John Kerry peace process in 2013-2014, and Lieberman’s colleagues on the Israeli cabinet called Secretary Kerry “messianic” and said they wished he would leave them alone. That is, the “rejectionists” are the Israeli government, the leaders of which refuse to recognize Palestine. Palestine recognized Israel two decades ago, giving away this key card for the sake of initiating the Oslo Peace process, which Israeli leaders such as Binyamin Netanyahu derailed, stealing ever more Palestinian territory on the Occupied West Bank and planting hundreds of thousands of Israeli squatters there, far beyond the recognized borders of Israel. ‘ # In 1998, Lieberman called for the flooding of Egypt by bombing the Aswan Dam in retaliation for Egyptian support for Yasser Arafat. # In 2001, as Minister of National Infrastructure, Lieberman proposed that the West Bank be divided into four cantons, with no central Palestinian government and no possibility for Palestinians to travel between the cantons. # In 2003, the Israeli daily Haaretz reported that Lieberman called for thousands of Palestinian prisoners held by Israel to be drowned in the Dead Sea and offered to provide the buses to take them there. # Also in May 2004, he said that 90 percent of Israel’s 1.2 million Palestinian citizens would “have to find a new Arab entity” in which to live beyond Israel’s borders. “They have no place here. They can take their bundles and get lost,” he said. Now that’s extreme. And it doesn’t even cover all Lieberman’s outrageous comments of the past 8 years. 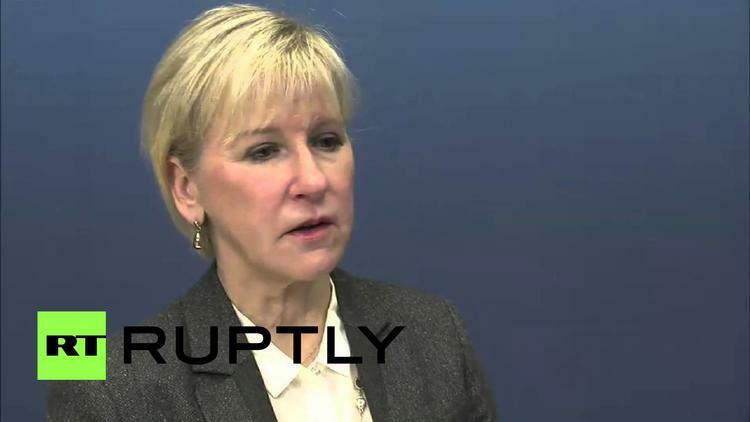 As for Sweden, Foreign Minister Margot Wallström observed, “We are not picking sides. We’re choosing the side of the peace process… The government believes that the international law criteria for the recognition of the State of Palestine has been met. There is a territory, there is a population and there is a government”. Sweden FM Wallstrom tells me she'd be happy to send Israel FM Lieberman an Ikea flat pack bc he'll see it requires cooperation and a manual.